The housing ministry has taken over the Malé City hall and its compound from the opposition dominated city council, in an attempt the deputy mayor says is designed to “wipe out” local governance. Acting housing minister Thoriq Ibrahim in a letter today ordered the council to vacate the city hall at Galholhu Billorijehige within seven days, and move to a smaller office at Huravee Building. 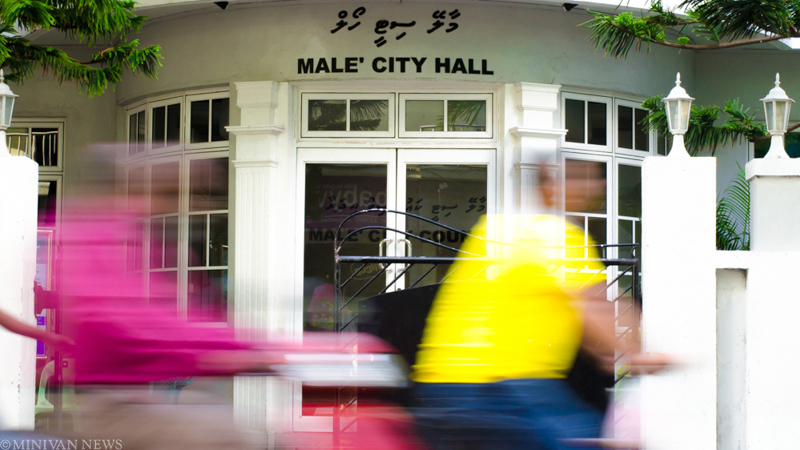 The opposition Maldivians Against Brutality coalition has been using the city hall and its compounds for rallies in recent weeks, following the housing ministry’s refusal to lease public spaces for opposition activities. The housing ministry had taken control of all of Malé City’s public spaces, parks and roads from the city council last year. According to Thoriq’s letter, President Abdulla Yameen and his cabinet on April 19 decided the city hall and its compounds were better suited for other government offices, which they say are suffering from a lack of space. The housing ministry today declined to comment on which offices are to move in to the city hall. In addition to the city hall, the housing ministry also seized control of the local market and a plot of land reclaimed for a new fish market in the northern Malé. Deputy Mayor Shifa Mohamed said that the cabinet’s decision violates the Decentralization Act. “The government does not know how to operate within a decentralized system. They don’t want to give even an ounce of power to the people,” Shifa said. The city hall takeover is the latest blow in a long running power struggle between the ministry and the council. Earlier this year, the ministry transferred a third of the council’s employees to the ministry. In October, masked individuals wielding machetes uprooted all of Malé City’s Areca palms. When the council attempted to replant the trees, the cabinet announced the council no longer had power over the city roads. Shifa has previously suggested that the government was ‘destroying decentralisation’ after the housing ministry seized numerous plots of land from the council including two parks, the artificial beach, the carnival area, the south harbour area, Usfasgandu, Dharubaaruge, and the area near the T-Jetty.